A. & F. Pears Ltd.
Thomas J. Barratt (1842-1914) of A. & F. Pears bought a painting by Sir John Everett Millais (1829–1896) of his grandson in 1886. He then reproduced it as a print, which became known as ‘Bubbles’. In this version, a bar of soap and the name of the company were added to the image. Such ‘artistic’ advertising appeared in the UK in the 1880s. It was initially characterised by the use of reproductions of works of art, and ‘Bubbles’ was perhaps the most famous example. T. J. Barratt was particularly keen to use the work of Royal Academicians, in order to add kudos and respectability to his product and so target middle-income customers. 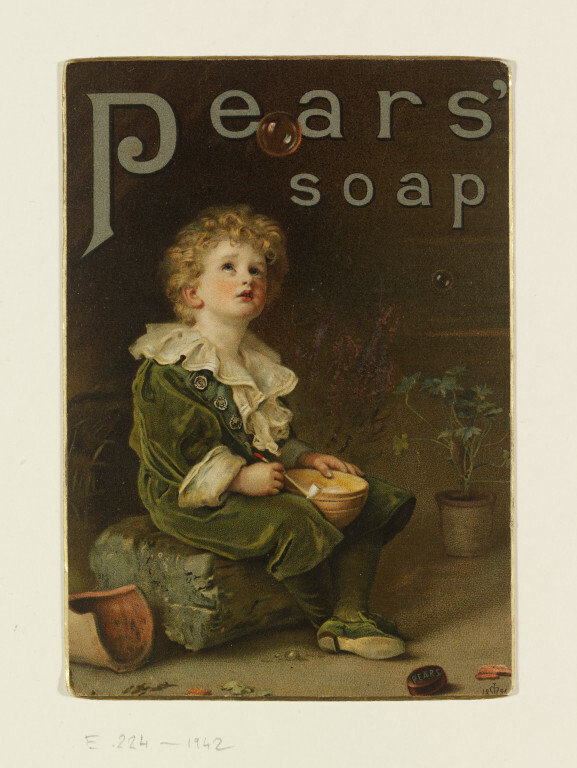 Proof of an advertisement for Pears Soap featuring a child playing with bubbles, from a painting by Sir John Everett Millais. With the addition of a bar of Pears Soap in lower right corner. This proof is mounted on card with gold edging. This is probably a / proof of the original lithography, done about 1888 or 1889. - / at least it seems to me / to be equal in quality to / it, though somewhat / soiled and faded. / [J?].H.K. / 27.7.35. The original painting was entitled 'A Child's World' and the model was Sir John Everett Millais' grandson. (Information from Terry Parker, a collector/dealer and expert on Pears advertising, via Archivist at Unilever). "'Bubbles' was exhibited at Tooth & Sons Gallery, 5 and 6 Haymarket, London, Spring 1886 no. 118. Sir Ingram, head of the Illustrated London News bought it from there to reproduce as one of four presentation plates given away with the Illustrated London News, Christmas 1886. Thomas Barrat saw the painting in his office and immediately decided to buy it. Ingram agreed as long as they could still reproduce it in ILN Christmas edition 1886, which obviously pre-dates A&F Pears presentation prints given away with the 1897 Annual. (The ILN version is smaller I believe and inferior print quality). Terry has come across one earlier A&F print which may have been a trial run, dated 1894. All of these were without the soap bar. The image was so successful that it was later used in dozens of different formats from postcards and showcards to billboard posters, with the addition of the bar of soap and A&F Pear logo." 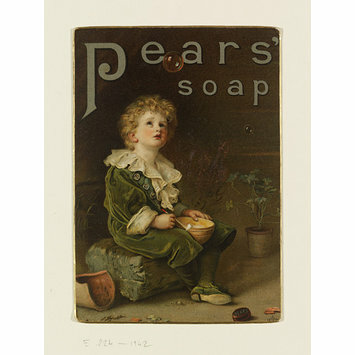 Proof of advertisement for Pears Soap, adapted from a painting by Sir John Everett Millais, 'Bubbles', colour lithograph; British, ca. 1888 or 1889. Victoria and Albert Museum, Department of Engraving, Illustration and Design and Department of Paintings, Accessions 1942, London: HMSO, 1955.